Tapeo recreates a Spanish Tapas bar from the food down to its upbeat Spanish music. The restaurant’ s long and narrow layout is perfect for what it does. It is a great place to chill or dine in with friends. In Spain, one generally eats standing up in a tapas bar because “tapeo” literally means “bar food”. Tapeo refers to hopping from bar to bar and enjoying glasses of wine with bite-sized tiny snacks or "tapas". 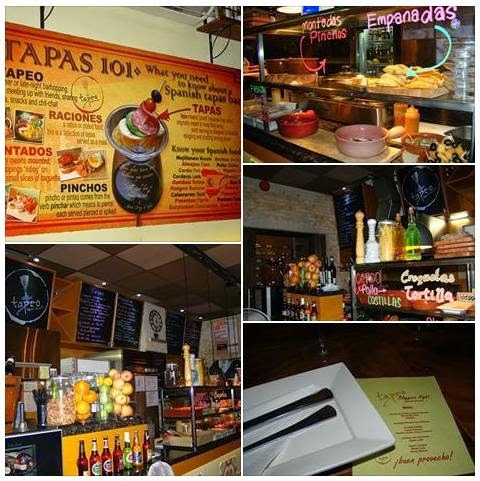 Tapeo will surely satisfy your cravings for tapas. When I stepped in Tapeo, I figured out that I was in for a treat! We enjoyed Selección White Maset del Lleó with Spiced Assorted Nuts (P 89) while waiting for our food to be served and for others to come. The said white wine in crystalline yellow color comes in a pleasant fruity taste and fine bubbles. Just the perfect drink to loosen the tongue and animate conversations! The Manchego Frito (P 342) or fried Manchego Cheese was a hit with everyone at the table. This Spanish hard cheese made from sheep's milk) is served crispy brown like a croquette. The Tortilla de Patatas y Jamon Serrano (P 195) is the traditional omellete made of potatoes andSerrano ham served with aioli. Indulge in Tapeo‘s UNLIMITED TAPAS promotion every Monday-Saturday at 2-9PM for only P 495 pesos. Other than the unlimited tapas, Tapeo also offers a whole slew of exciting Spanish dishes. For those adventurous in food, the Spanish eel delicacy called "angulas" makes a unique tapa experience. Baby elver eels come in a spicy concoction and served with crunchy bread. I enjoyed my first introduction to this ethnic food. Suprisingly, there was no after taste. Lechuga Romana con Cabrales (P 195) is fresh salad with engaging flavors. It has exquisite apple taste to my liking that I hoped then to get another portion. Luckily, I was glad to know that the pinchos are served with it as well. After tapas and starters, we had meat and skewers "pinchos" for main course. Pinchos are wonderful kebabs enjoyed at bars all over Spain. Costillas Asadas (P 498) are tangy, barbequed Spanish Pork Riblets heavily sprinkled with pepper. It comes with a side-by-side serving of Patatas Bravas (fried potatoes with spicy tabasco sauce), as complementary tapas. While the meat appeared a little overcooked, it was still delightful! The spicy, garlic mayonnaise flavor of the diced potatoes was nicely paired with the pork. Pinchos De Atun Tuna (P 285) are tuna kebabs served with saffron rice. It is a simple yet a tasty dish. It was cooked rightly and doesn't break apart. Pinchos de Cordero (P 315) are lamb skewers served with saffron-infused rice. The rice was cooked just right, not soggy. Cerdo al Horno (P 340) is oven-roasted Crispy Pork Belly served with rice, vegetables and baked beans. Though the pork appeared crispy on the skin and outside, it was tender and soft inside. The side dishes do balance out its salty pork flavor. Tapeo has the best Sangria (P250 per glass) ! It was a perfect complement to the delicious meals. Chef Mon and Chef Day guided us throughout the degustation adventure. They experiment with recipes to bring out unique, scrumptious taste that would entice diners to go for seconds. The chefs told us that they only serve the best imported wines to complement Tapeo's traditional Spanish dish experience. Overall, my dining experience at Tapeo was great. Our food was prepared well and the portions are satisfying. Go and dine in at Tapeo! The Tapeo menu is extensive! It features signature Spanish treats like Jamon Ibérico, Chorizo Ibérico, Albóndigas, Calamares, Tortilla, Callos and more. Give their dishes a try, sample Tapeo's different types of Tapas to your heart's content and you might just be surprised with its culinary fusion.